An alternative approach is to infer the valve position by trending the pressure in the hydraulic lines. However, frequent transmitter blockages compromise accuracy and further errors are derived from inherent differentials between open and closed pressures. Incorrect valve position indication and control can lead to process failure, shutdown and, most importantly, can have significant negative implications for site safety. 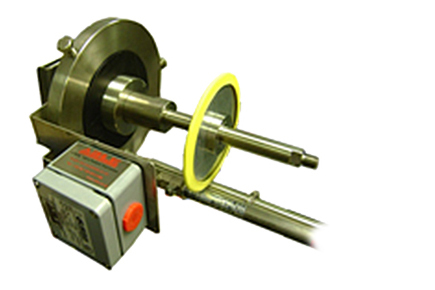 Equally, reliable, accurate, continuous measurement of valve position enables the monitoring of speed and uniformity of movement providing diagnostic insight as to the condition of the valves and hydraulic feeds. ABLE Instruments & Controls Ltd were approached by a major North Sea operator to design and implement a solution to the problem and, as a result, developed a universal valve position transmitter, the v-Trakka. The v-Trakka can be retrofitted to most types of surface Xmas tree valve and provides an accurate and repeatable analogue output which tracks the physical position of the valve. The 2-wire, EEx d loop powered transmitter delivers a compact, lightweight design and the robust 316 stainless steel cover renders the v-Trakka immune to the effects of the harsh offshore environment. Over time, the v-Trakka design evolved in response to operator feedback from observations whilst in use offshore: It was noted after several weeks of use that repeated opening and closing of certain valves, to which the v-Trakka had been fitted, caused the valve stem to rotate, therefore compromising accuracy. To negate this, ABLE redesigned the directional magnet assembly to incorporate a ferrite ring magnet which generates a 360 degree field. The consequent shaped flux field provides more reliable and precise switching of the reed-chain resistive ladder sensor. The stainless steel cylinder cover, which offers protection from physical damage and the frequent mud washing that takes place on the decks above the valve locations, has also undergone design revision. The current “Easy-fit” version includes a bayonet style attachment method and a locking thumb screw to protect against horizontal, vertical and rotational detachment. Approximately 200 v-Trakka’s have now been deployed across several North Sea assets, replacing basic limit switches and high maintenance pressure monitoring. The v-Trakka is also available with ABLE ATEX EEx limit switches where existing control systems are not yet analogue ready, with simple upgrade to a transmitter. For more information on the ABLE v-Trakka, please click here.